Louvre Abu Dhabi is turning a year old! 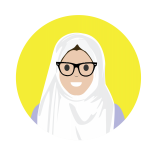 It has already proven itself to be a raging success in the UAE, as the new cultural beacon! The museum is one of the iconic attractions in Abu Dhabi that has come up in the recent years, from Ferrari World and Warner Bros. Abu Dhabi. If you somehow haven’t been to this gorgeous and culture-rich museum yet, then read on to be convinced other wise. The Louvre Abu Dhabi museum is chockfull of must-see artworks and installations from around the world, spread across 12 galleries that explore the chapters of the world. But today, museums are increasingly shaping their experiences around social media – Louvre Abu Dhabi has 112k followers (and climbing) on Instagram itself! And let’s be honest, we’re all always on the lookout for that perfect shot on Instagram, aren’t we? So, we’re bringing you the most show-stopping, inspiring and simply awesome artworks and installations at the Louvre Abu Dhabi that will totally get you ahead of your Instagram game. Read on to find out which the best exhibits to check out at Louvre Abu Dhabi – where you can get the coolest Instagrammable shots for your feed. And keep reading further for all the need-to-know when visiting the museum – timings, ticket prices, location and more! The first exhibit on the list is one of the last you’ll encounter in the Louvre Abu Dhabi museum. The Fountain of Light is a staggeringly stunning structure, made of twisting steel and 32,400 glass crystals. And it’s no surprise this sparkling sculpture by Chinese contemporary artist and activist, Ai Weiwei, has become a social media favourite. 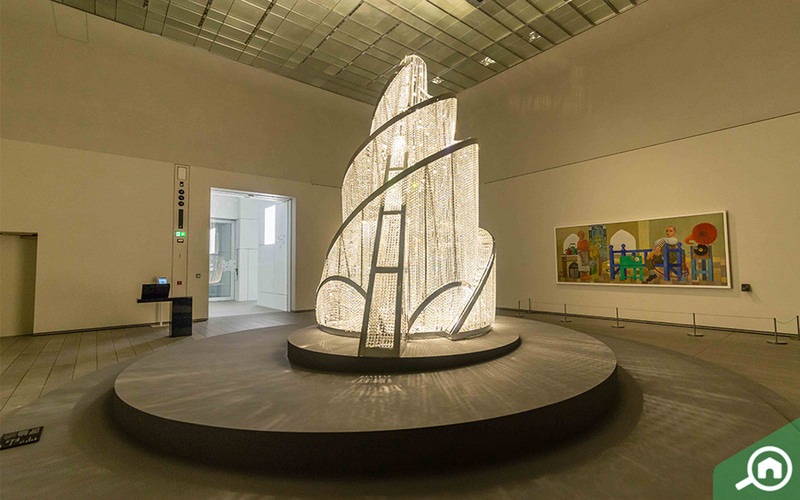 While this version of the sculpture was made and adapted for the Louvre Abu Dhabi, it’s actually based on an earlier version Weiwei made in 2007 for Liverpool which, in turn, was based on an unbuilt structure from nearly a century ago, Tatlin Tower in 1919! This 2,000-kilogram structure with 150 lights sits in the last gallery of the museum – a spectacular end to your museum experience. This striking installation has an intriguing history behind it – and is the perfect way to get some bling to your Instagram feed. 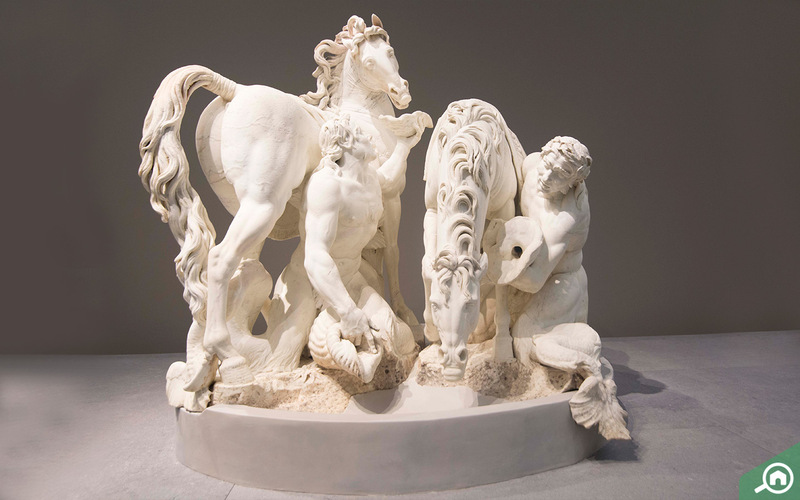 Up your Instagram game with this glorious 350-year-old sculpture, Horses of the Sun, commissioned in the 1660s by none other than the Sun King, Louis XIV himself! As a young king, Louis XIV wanted to associate himself with the God Apollo, who stood for the sun, peace and the arts. Depicting a Greek God at the end of his procession on the chariot, this majestic sculpture sits in Gallery 8, which is dedicated to ‘The Magnificence of the Court’ and showcases remarkable paintings and sculptures of rulers and royalty. Enter this gallery and your attention will instantly be arrested by this eye-catching sculpture that dominates the room. Brought from the Southern Netherlands, it’s impossible to ignore this mammoth tapestry that dominates an entire wall of the gallery. 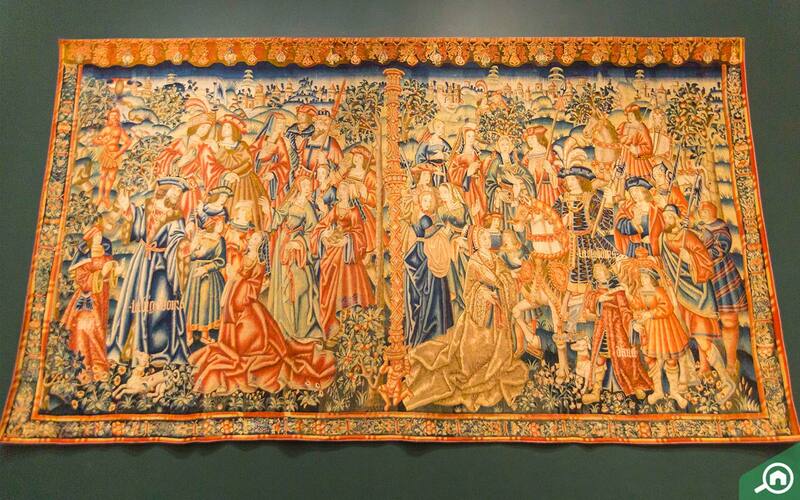 The beautiful 16-century tapestry is made of wool and silk and illustrates a Biblical scene. Interestingly, the clothing in the tapestry is from the early 16th-century fashion, and the figure in blue on the left is none other than the Babylonian King Nebuchadnezzar himself! This quirk was typical of tapestries made at the time. These precious tapestries were created to glorify rulers and kingdoms. The rich colours and fine detailing are definitely worth a spot on your Instagram feed. 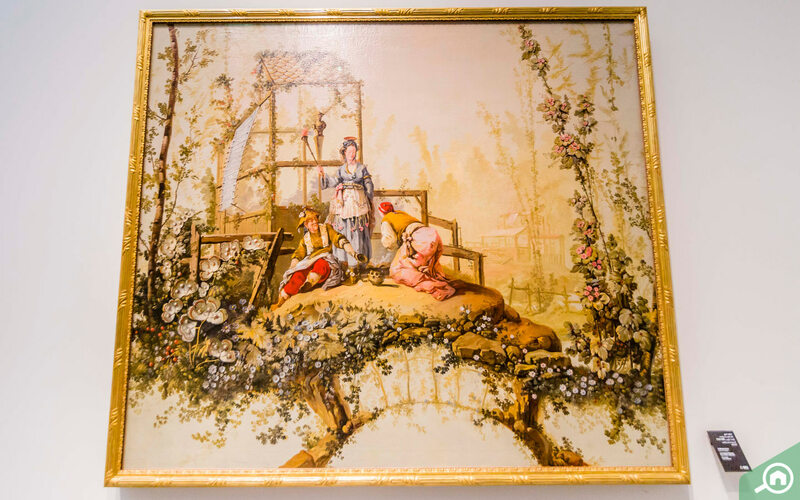 This is a painting that needs no introduction to the art world. This oil on canvas painting features the infamous Napoleon Bonaparte astride his horse, as he crosses the Alps into Italy in 1800. 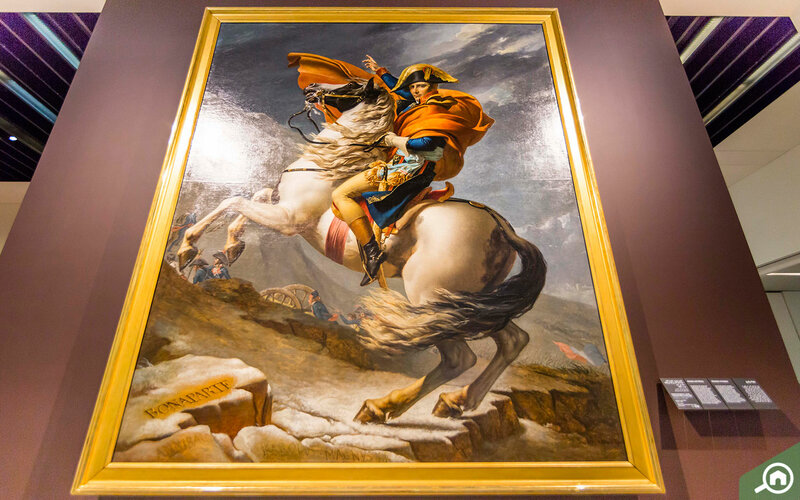 Every element of the painting – from the horse to his cape being swept upward, paints Napoleon as brave, bold and heroic. Funnily enough, in reality, Napoleon was not a confident rider and would have actually made the crossing on a mule than a horse! 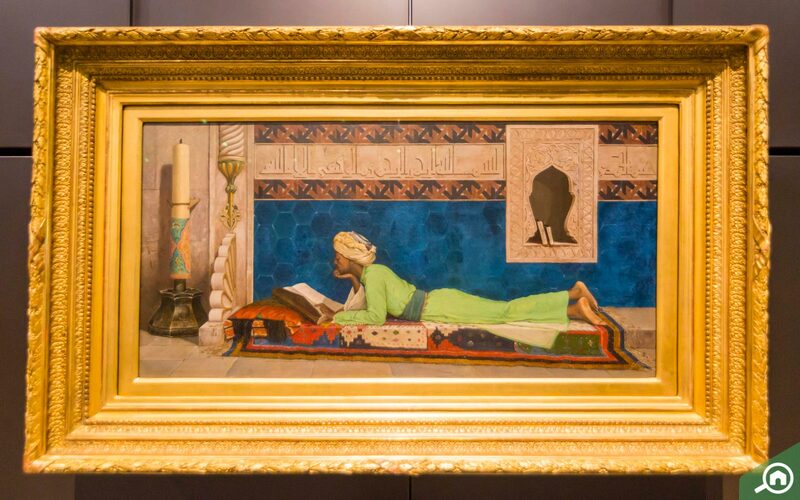 This stunning, bold masterpiece is one you can’t miss on your visit to Louvre Abu Dhabi and is definitely a way to add some culture and history to your Instagram feed. Add an artistic flair to your Instagram account with this installation – described as a visual poem. This interesting installation is closer to home and is the work of Saudi Arabian artist Maha Malluh. It consists of eleven burned cooking pots, which were used to cook a traditional goat stew. 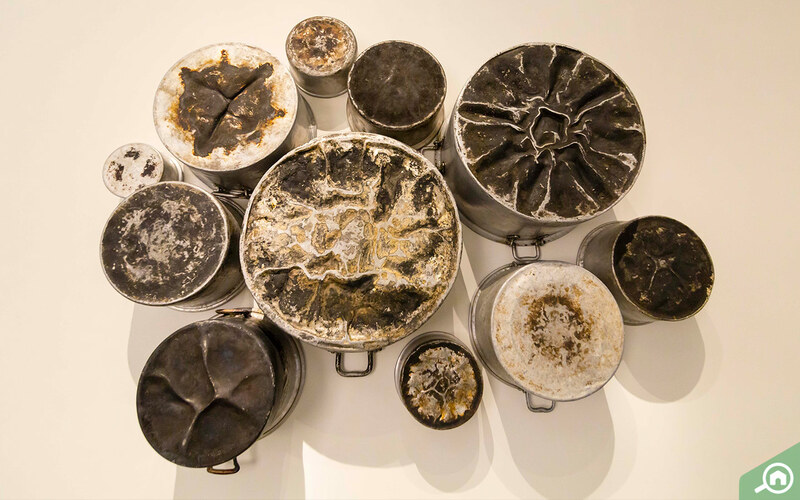 A nod to classical Arabic poetry, these burned pots are a reminder of the stories told at mealtimes in the nomadic tradition. This is perhaps the most Instagrammable spot in the Louvre Abu Dhabi! You’ll spot the immense, sparkling domed roof as you begin to approach this wondrous museum-city with streets and waterways, featuring artworks inside and outside the museum. This mesmerising roof is the work of award-winning architect Jean Nouvel, whose inspiration came from Abu Dhabi’s palm trees. This architectural marvel is made up of eight different layers, and the result of dome’s design is 7,850 stars! Stand underneath this roof for the full effect: as the sun passes above, the light filters through the stars to create an enchanting ‘Rain of Light’ effect. It’s similar to the dappled light that filters through the palm leaves. So, whip your phones out and click away at the most Insta-worthy location in the museum. Roam underneath star-speckled domed roof by Jean Nouvel, and you’ll stumble across another extraordinary creation by Giuseppe Penone. 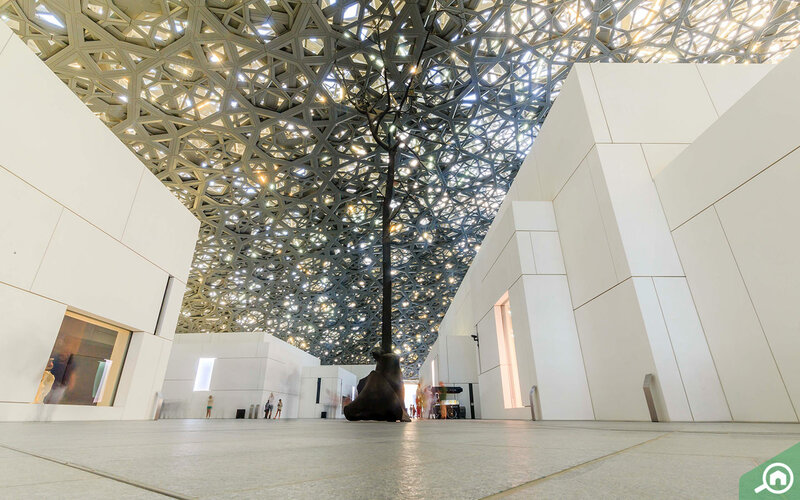 A life-like tree structure reaching out toward the sky steals the show – one of the first contemporary works commissioned for the Louvre Abu Dhabi. This bronze structure is a cast of a wild cherry tree, chosen from close Penone’s own home near Turin. Look closely and you’ll find the reflective steel panels inserted into the cast – that catch the light to create their own dazzling effect. A worthy addition to your Instagram feed, you’ll be re-gramming this one for months to come! This magnificent marble relief outside the museum rounds up our list of Louvre Abu Dhabi’s most Instagrammable spots. The impressive relief of cuneiform text (one of the oldest systems of writing) transcribes a creation myth in Sumerian and Akkadian from a Mesopotamian tablet from 1250 BCE. It’s one of three stone walls commissioned especially for the museum from American artist Jenny Holzer. Strike a contemplative pose in front of these impressive stone reliefs engraved with priceless historical text – and you have yourself a perfect Insta-worthy shot. While you can buy tickets on-site, we recommend buying tickets online to avoid the long queues. This will be helpful especially if the little ones are coming along. Make sure you select the right date when purchasing tickets online. You can also enter discount codes to get reduced prices on your tickets! Remember to bring all supporting documents with you to avail the reduced prices! The Louvre Abu Dhabi is open on all days except for Monday, so bear in mind when planning your visit. The museum is located in the Saadiyat Cultural District in Abu Dhabi. There are plenty of ways to get to the museum, so you won’t miss out on seeing the stunning artwork and installations. Louvre Abu Dhabi is 1-hour 30-minute drive from Downtown Dubai and the best way to approach the museum is by car. When approaching from Dubai or Abu Dhabi, take the Saadiyat Island/Yas Island exit on Sheikh Khalifa Road (E11). Drive through the Yas Highway to the Cultural District on Saadiyat Island. You’ll find road signs off the highway to the Louvre Abu Dhabi Museum. Free parking is available at the location, although valet parking is available near the drop-off area for AED 42. Looking to take a bus to the museum? The public bus route 94 stops at Louvre Abu Dhabi (Saadiyat Island). 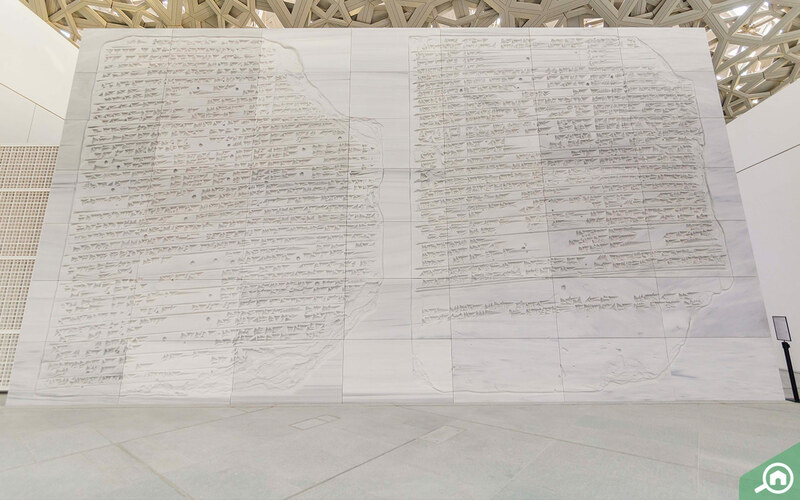 You can get in touch with Louvre Abu Dhabi through phone and email. The Louvre Abu Dhabi museum is a large area to cover. Make sure to arrive early to make the most of your visit. The galleries of the museum are numbered so that visitors can easily navigate through the museum in sequence and appreciate the whole museum experience. There are multimedia guides available at the museum for AED 20, which guide visitors through galleries and explain the artefacts. Carry a valid ID with you to collect the multimedia guide. Alternatively, if you want to learn more about the artefacts from an expert, there are tour guides available for an extra cost. 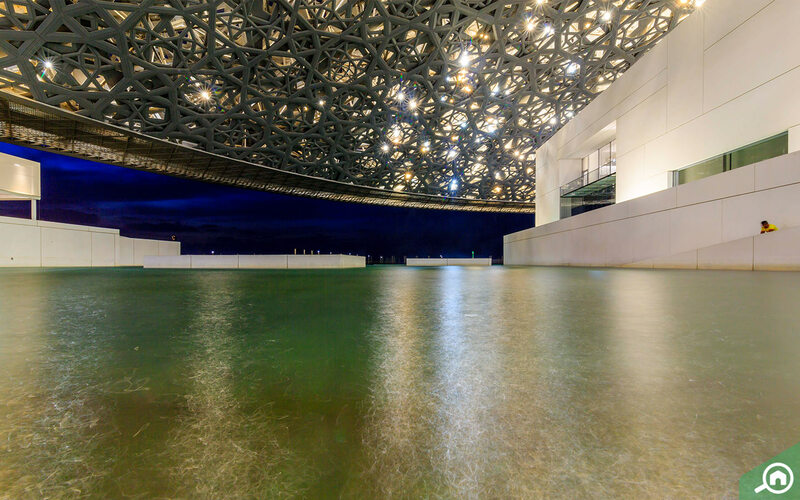 Check the Louvre Abu Dhabi website for upcoming tours and availability. Purchase all tours and workshops online at 72 hours before your visit, so there’s no cancellation and disappointment! There are wheelchairs and strollers available for loan at the museum so that everyone can enjoy the experience! Got extra items you don’t want to lug around the museum? There are lockers in the main hall of the museum to store any items safely. 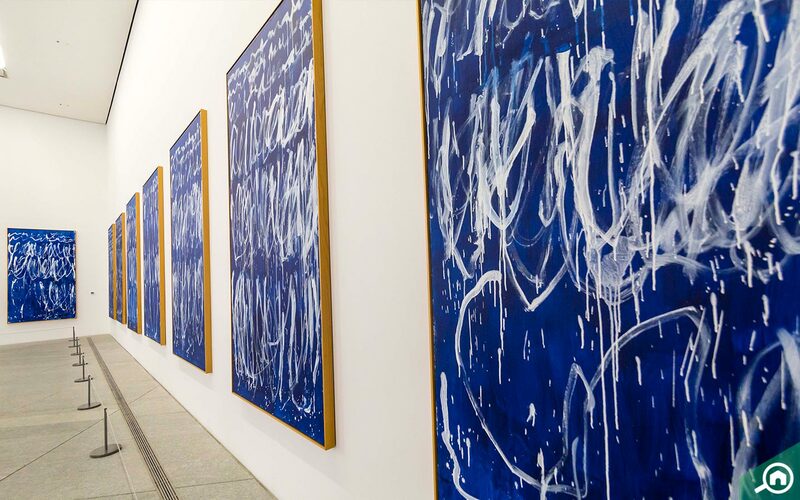 So, if you’re catching Dua Lipa live in concert at Louvre Abu Dhabi, don’t forget to check out these amazing exhibits too. And if you’re not, you can still step up your Instagram game with these jaw-dropping exhibits! Fallen in love with the city? 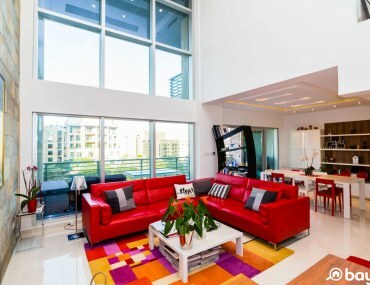 Take a look at some of the best residential areas for families in Abu Dhabi. And check out Bayut’s Abu Dhabi Q3 Report 2018 Market Report to make the right decision for investing in the city. 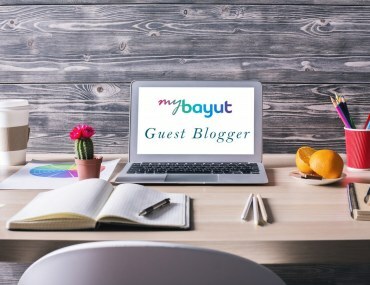 And follow, MyBayut, the best real estate blog in Abu Dhabi, for more reviews of the city’s best attractions and hotspots.